2oz — The Avenger 2-Part Ceramic Coating is the toughest and longest-lasting nano ceramic coating on the market. Formulated using nanotechnology, this product produces a molecular bond with the surface it is applied to for ultimate protection. The result — a surface that is hydrophobic, oleophobic, dirt repelling, UV protected and heat resistant. This product is preserving historic air crafts, vintage boats and cars as well as off-the-lot luxury vehicles, marine and air crafts. This product is one of a kind in the world of aerospace coatings. Great results on both gloss and matte finishes. Use this ceramic coating on metal, painted or bare, and plastic — The Avenger rescues, preserves and protects. The ultimate protection. Guarantee Personal service. Relentless dedication to quality. Your happiness, or your money back. "This is a car that is a daily driver and always sits outside in the driveway. I have tried to keep it clean, but I was failing. Thanks to John’s 360° it looks better than brand new!" 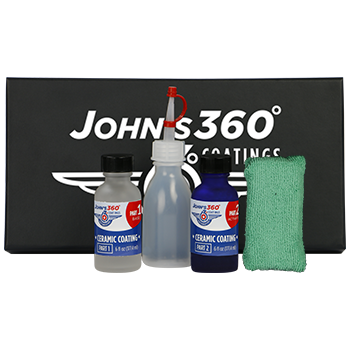 "Your coatings went well on my 2015 Mustang GT and 2019 Rubicon Jeep. The best part is how smooth the 'skin' feels on the two cars (smooth as a baby’s bottom)."